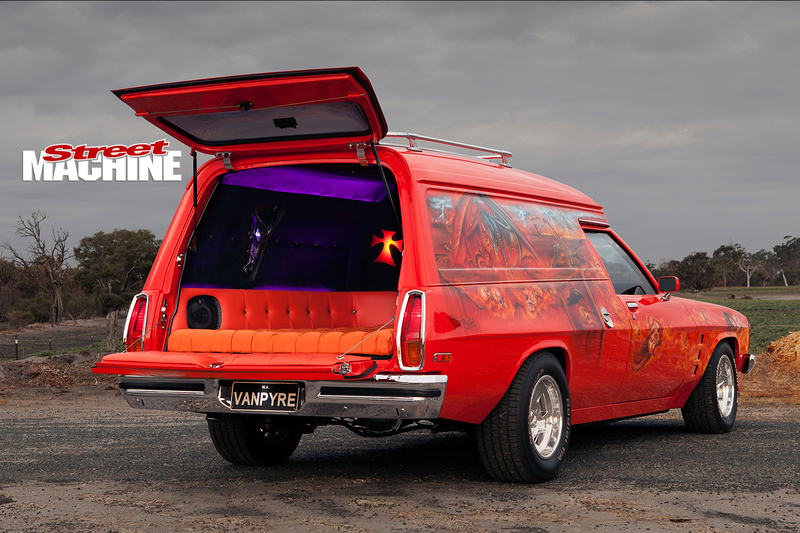 LIKE all great panel vans, Donna and Keith Richardson’s VANPYRE is in a constant state of evolution. Purchased a few years ago as a genuine HJ Sandman in need of some TLC, Keith and Donna soon had it looking much like it did when it left the factory – but it wasn’t going to stay that way for long. “I was a panel vanner back in the day, when I was 18, 19 – until I got married,” Keith says. “Then the house came along, then kids, then divorce, then back into cars again.” Only this time around he was joined by Donna, a lady who’s as much, if not more, into cars as Keith himself. “We bought it about seven years ago,” Keith says. “I probably drove it for a week, then went away to Bathurst for the race and when I came back that was it – I started pulling it all apart. I thought I’d be able to finish it all in six months – three years later it was on the road, but it’s still not finished. Three years to build a car doesn’t sound like a long time to us, but clearly Keith doesn’t like to stand around doing stuff-all. “I rang up to get it sodablasted, but there was a three-month wait, so I went and bought my own sodablaster and did it all myself. Even Donna was inside the back of the van sodablasting. 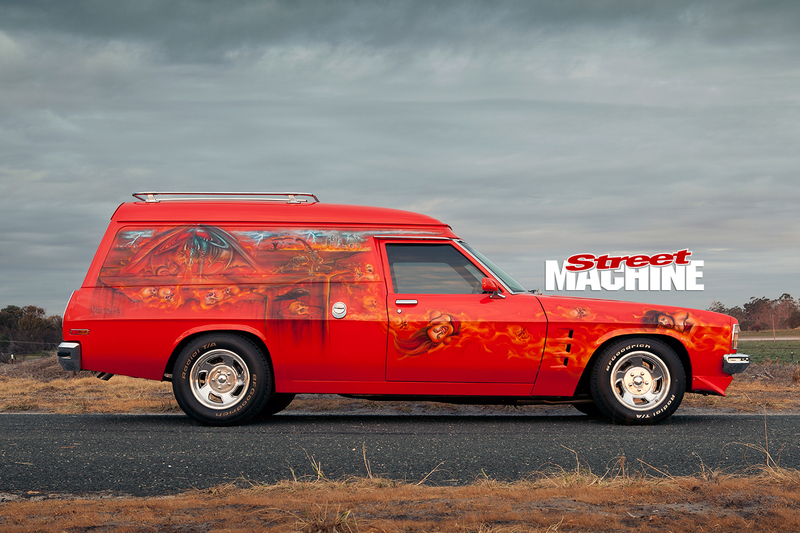 The car was finished in the original Mandarin Red, but the evolution to full custom panel van didn’t take long to kick in. 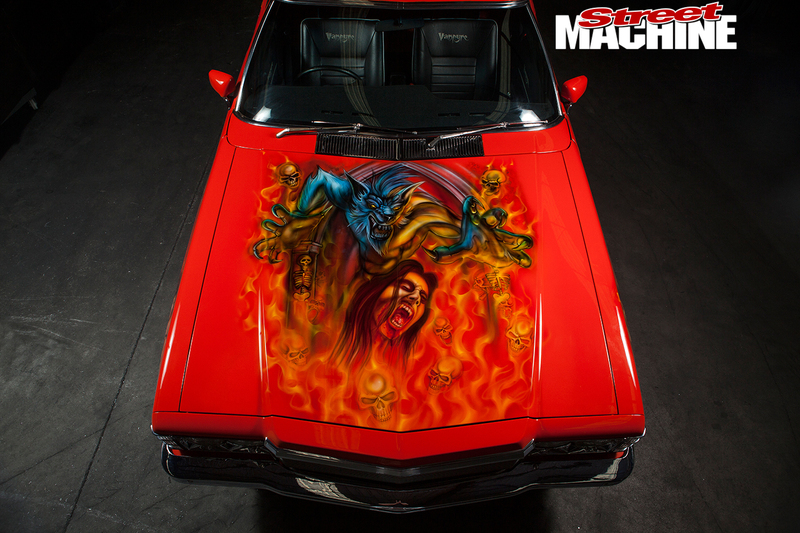 It started off with some murals by Sam Hawkins at Awesam Paint Works – just a couple initially, on the bonnet and tailgate. 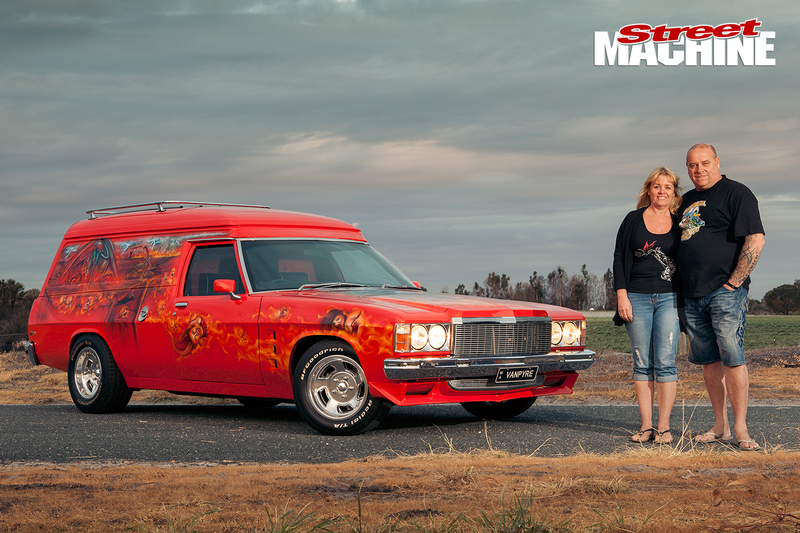 Then Donna and Keith decided to step it up a bit and handed the car over to Jamie Collier at Creative Works. 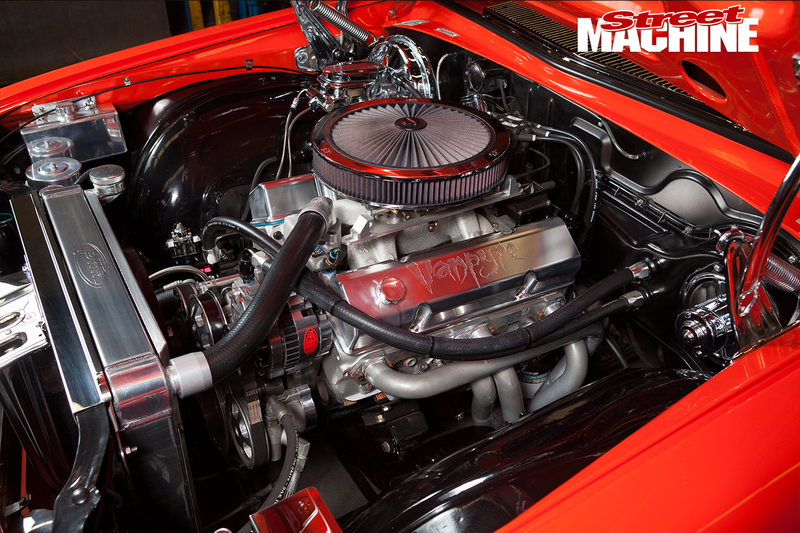 “I just gave him the car and asked him to put certain things in it and said it was up to him to design,” Keith says. 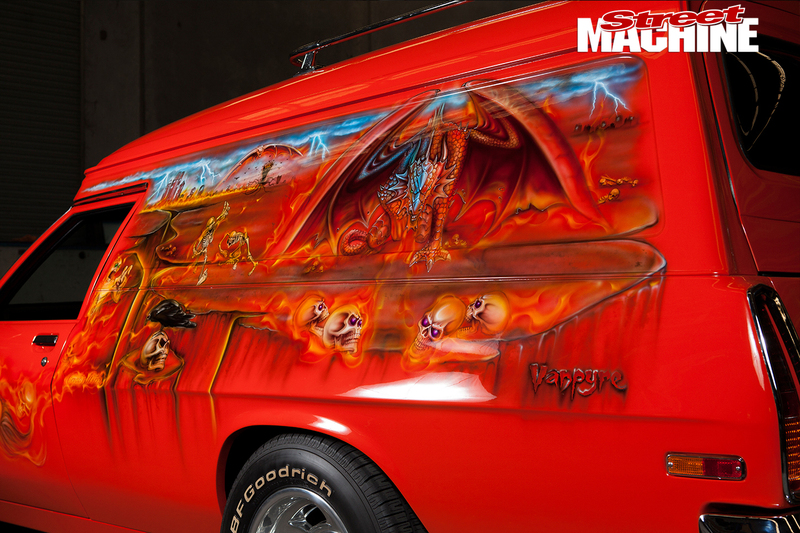 What you see on the van now took several visits to finish off, with the murals growing and extending to cover most of the bodywork. Once it was all done, a coat of House Of Kolor clear locked it all in. 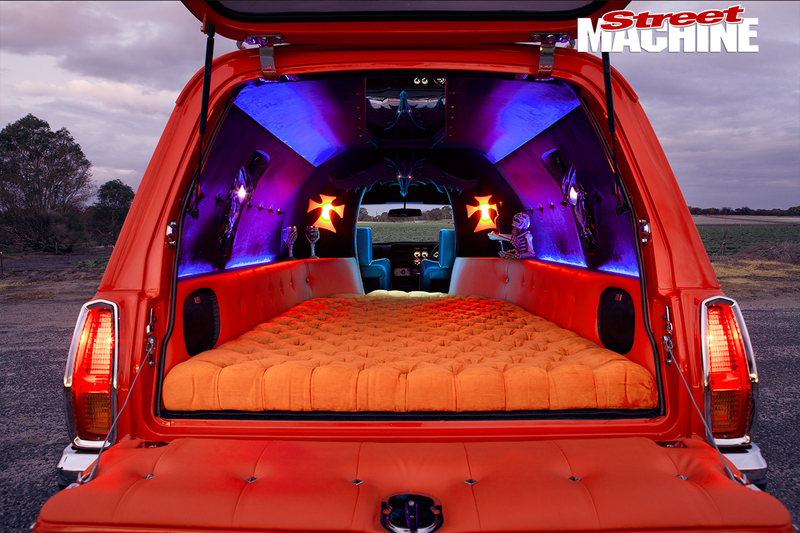 The most recent addition is the custom interior in the van’s party section. In the initial build it was a pretty low-key black affair with some piping – nicely done, understated and simple. 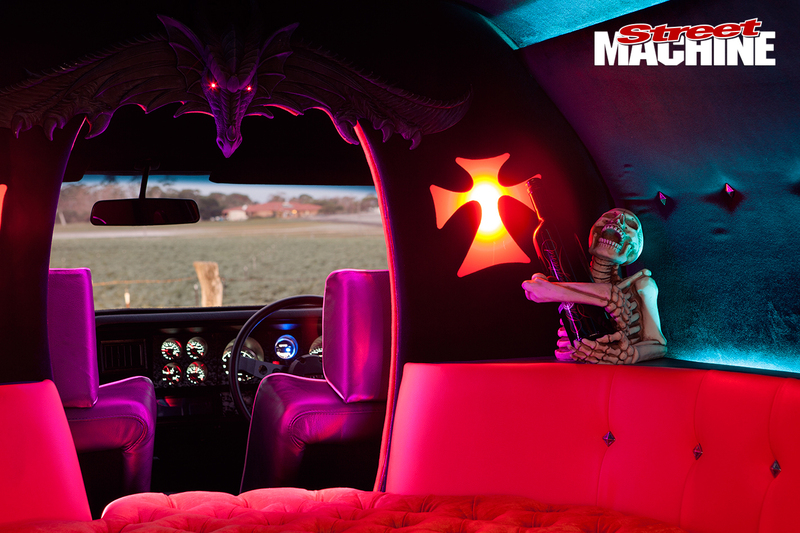 But that’s not what people expect to see when they look in the back of a custom panel van; they want mirrors and neon lights and buttons, lots of buttons – so that’s what Keith gave ’em. 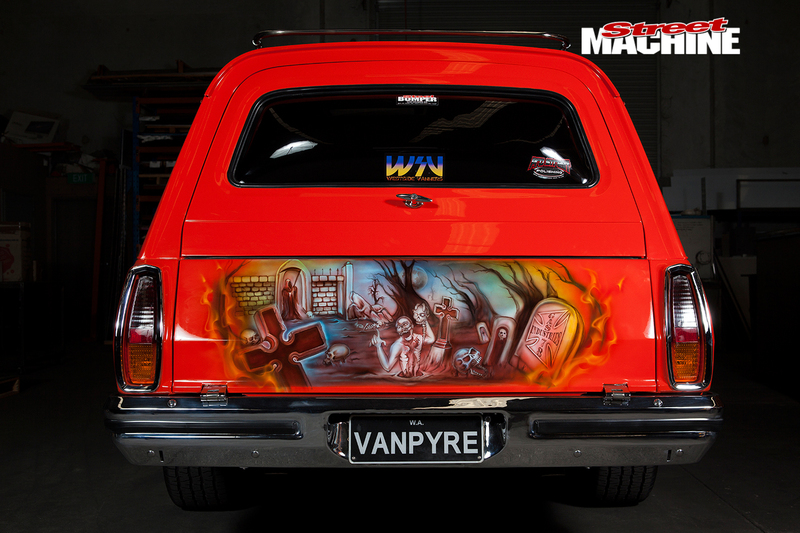 “Everyone said the back was boring, so I took it to World Custom Trim. They said it was a big challenge, but they enjoyed doing it because it wasn’t something they’d normally do. I just said I want some orange in there, some black, I want the archway, some hidden lights, and that’s what they came up with. The wheels have gone through some evolutionary steps as well, with GTS rims and Dragways doing duty on the car for a while. The latest additions are the Halibrand Sweet Swirls you see here, measuring up at 15x8 and 15x8.5 and wrapped in 225/60 and 255/60 BFG Radial T/As – with the white writing on the outside of course! And the final touch – for now – will be a Jag rear end, “just because they look good”, according to Keith. Can’t argue with that. With all those changes on the cards, the next time you see VANPYRE it will look even wilder, and who knows, Keith and Donna might even crack a spot in the Top 10 at the next Van Nats.